I like cheevo mining (playing back through old games to get additional achievements), and recently played through F.E.A.R (known as Fear from now on) in pursuit of some. 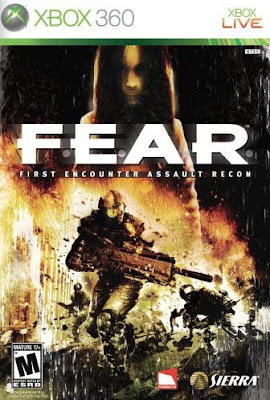 Fear was quite an early 360 game, and was ported over from the PC. It was billed as a survival horror first person shooter due to the presence of a creepy ghost child in a red dress called Alma who popped up at points throughout the game. You play as the Point Man for a secret special ops group of the U.S. government specialized in dealing with paranormal threats. A man named Paxton Fettel has escaped from a cell, and has gotten control of a battalion of soldier clones that he can psychically control. Your squad have been charged with hunting Paxton down, as with him captured his psychic link with the clone soldiers would be broken. Starting off at some abandoned offices you soon learn that his clone army is assaulting Armacham Technology Corporation (ATC) which leads you there. 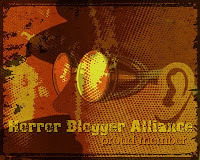 Eventually you discover ATC's experiments with a young girl called Alma who it seems Paxton is trying to locate. It seems that both you and Paxton have some connection to this crazy ghost. The game is first and foremost a first person shooter. The main enemies are the clone soldiers who reminded me heavily of the main enemy of Half Life 2, both in looks, and voices. The soldiers yell out commands to each other and show a surprising degree of A.I. They try and flank your position, use cover, and even try and retreat should they get too battered. The other type of enemy is the ATC security forces. They have been instructed to stop anyone from finding out ATC's secrets. At some points in the game when the clones and ATC both turn up they start fighting between themselves letting you either watch, or use the distraction to take them all out. The enemies are fun to fight, and are quite varied, especially with the introduction of invisible assassins (that the recent Wolfenstein copied) and powerful mechs. The character you play as - Point Man has bullet time powers. You are able to briefly slow time down which is key to taking out the many enemies, as well to escape explosions. You can hold up to 3 weapons at a time. These range from the normal guns expected such as assault rifles, and shotguns (the shotgun is a very cool weapon in this game!) to more experimental weapons such as a gun that fastly fires bolts that can pin enemies to walls, and a long range rifle whose bullets totally strip the skin off the victims it hits leading just a bloody skeleton behind. The aiming for the most part is annoying though, as even zoomed in you never get to really have precision on where you are firing, so I tend just to spray bullets in the general direction of enemies. The game like Condemned all takes place in ultra realistic locations. The game even uses the same objects, such as identical calenders showing up. This makes the game feel like it takes place in the same game world as Condemned. Starting off at dockside warehouse, you go to the ATC HQ, as well as derelict buildings, and a underground vault. There are friendly characters you encounter during the game which splits up the fighting, but most the chatter takes place over Point Mans headset he is wearing. The Supernatural element of the game mostly revolves around Alma. Usually when nothing is happening (there are lots of times when you are exploring places with no enemies) the screen will rumple, static will play and then you will see Alma creepily walking around. A few points she will actually be after you, but mostly it is just to try and create fear. Paxton does the same to you, and also you have hallucinations every now and again that transport you to a Hospital setting where the walls literally ooze with blood. Talking of blood, the game is quite bloody. You are not able to maim enemies, but shooting them results in lots of clouds of blood, as well as the walls, and floor getting caked in the stuff, this looks real cool. 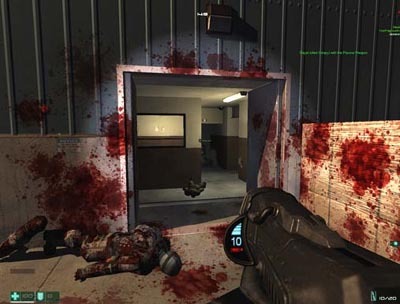 The locations have lots of destructible elements, mostly windows, and crates, but there is nothing better than making an entrance to a room via shotgun blast to a window. The game is really not scary, and the plot takes itself far too seriously, but despite this it is fun, and addictive. The later Fear games reduced the fear element and added in more mechs and action, but Fear is at it's best when there is action punctuated with slow exploration sections. Good game, especially like the creepier elements that really made my skin crawl.